With a sound and build quality that defies its price the WA12 has everything to recommend it. Suits dynamic, condenser, ribbon and DI sources. Great sounding. Excellent value for money. 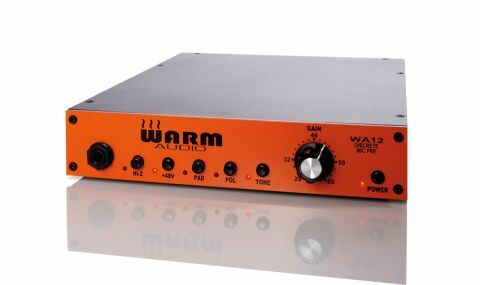 The WA12 is the first product from Texas-based Warm audio. This unit is based on the classic API 312 design although it's not intended as a clone. Straight out of the box the bold front panel colour scheme instantly sets it apart from many of its competitors. A lot of users are going to dig this, as it has a touch of '70s retro about it which, as you will see, fits its overall character. This is a half-rack device and although not the heaviest unit of its size, it feels substantial. The front panel hosts six switches, all with LED indicators, Hi-Z instrument input and a Gain knob. This knob is indented, but is a variable pot, making settings easily recallable. The rear panel has a dual XLR/TRS input socket, separate XLR and TRS output sockets, and the power input socket for the 24V DC power supply. "Construction is very neat and tidy and would certainly be simple to work on should repairs be needed in the future"
Taking off the lid, the construction is very neat and tidy and would certainly be simple to work on should repairs be needed in the future. The WA12 also contains two custom Cinemag transformers. Cinemag are a US company that have been building audio transformers since the early '70s. Its transformers have graced many classic audio designs and can currently be found in units by Universal Audio and Tonelux. Suffice it to say that their presence and the quality of construction around them get the FM thumbs up. Different audio sources require different input impedances. While 600 ohms works for most condensers and dynamics, ribbons are often happier with lower impedances. Push the Tone button in and the input impedance changes to 150 ohms. You can try this on any input source and the results are excellent. As a general rule condensers sound 'right' with it out and ribbons with it in. However, the WA12 is a quality unit so impedance miss-matches sound different rather than wrong, so every input can have two different flavours at the touch of a button. This works on the Hi-Z input too, so DI'd instruments benefit from the same tonal variations as microphones. The other buttons do exactly what they say, the pad being -20dB ( exactly what a pad should be) and they feel positive to the touch. "Warm Audio has really come up with something special here"
With its API inspired design, build quality and component choice you would expect the Warm to sound good, and it doesn't disappoint. Plenty of level, lots of headroom and there is a real focus to the sound. Everything we put through it worked exactly as was expected. The character is in the name, especially with the Tone button in play. Lots of classic '70s style warmth and punch. Particularly impressive is its handling of low-end. Bass guitar and double bass both worked great, DI'd and amped. Acoustic guitars felt full and rich, and when it came adding EQ it was all there right across the spectrum. With vocals it was the same. Real depth and presence and a well balanced tonality that you could change at the touch of a button. Warm Audio has really come up with something special here. As a pre it will handle any mic you plug in, and on top of that its also a great DI. The price point would allow a few minor gripes to pass without too much concern, but really there are none. If it was twice the price it would be getting just as positive a review. It's a real groovy box.